OK, cheaters, here you go. 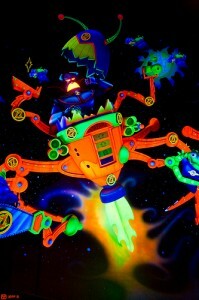 When you enter the ride you will see the scoreboard blink, that’s the time to start shooting. Just hold the button down for the whole time you’re on the ride. You’ll score points even if you don’t hit anything. If your car stops during the ride, keep shooting. The points keep adding up even though the ride is stopped. The smaller the target and farther away it is the more it’s worth. If it’s in motion it’s worth more than a stationary target. As you leave the first shooting area there is a target on the ceiling behind you, it’s worth 100,000 points. Yeah, there are others, but Dad’s got to have some advantage.